It seems a lot of people don't know about this, and since there's nothing on the Wickes website about it, it's not surprising. 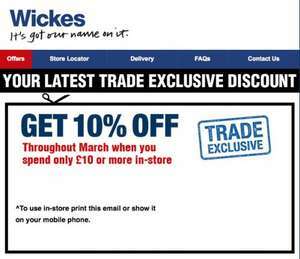 If you're in the trade, you can sign up to receive an email each month from Wickes which contains an offer valid for that month. So far, every month this year, it has been 10% off when you spend £10 or more in store. To get these emails, go into a Wickes store and ask to register for their "Exclusive Trade Emails" and they will give you a form to fill out. You'll then get an email at the start of each month with your discount, which is simply a barcode that they scan in store and your discount comes off (can scan from your phone, or from a print out). Although this won't appeal to everyone, since it is trade only, hopefully it will help some of you! Hi can you please write down what the code is for this month as am purchasing new doors for the whole house, so will be able to save alot of money. There is no code, it's a barcode which they can only scan on their tills. This month's discount is also 10% off when you spend £10 or more. Thanks op. I signed up today and have received a welcome email but no barcode? How long after you registered did it take to receive the barcode? You should get it a couple of days after the welcome email.